Aloha friends!! I hope you are enjoying your Monday even if you had to work today. Many of you lucky teachers out there have the latest technologies in your classroom, specifically SMART Boards. I have always been jealous of the wonderful ways teachers were using them in their classroom. Our school does not have any in the classrooms and I don't believe they will be in the budget anytime soon. 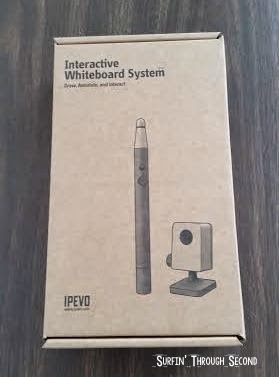 Recently on my Twitter account I ran across a tweet from a company called IPEVO. It was about their Interactive Whiteboard System and I started reading more. It seemed like a great alternative to a SMART Board and the price was amazing!! I contacted the company to find out more information about their system. They were kind enough to send me the system to review and share what I thought of using it in my classroom. I received the item very quickly and it was in such a small box I couldn't believe it. I read the quick set up directions and ran the CD in my computer. Once the software is loaded onto your computer, it's a snap to set up. Basically you have 2 pieces. 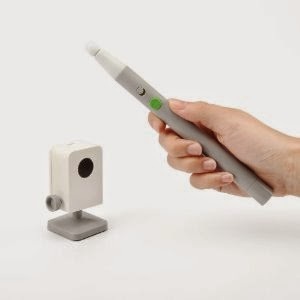 The sensor cam and the wand. You can adjust your projector to where you would like to use it in your classroom. Then you plug in the sensor and calibrate the system. It literally takes me less than 3 minutes to set it up and calibrate it. Here is a quick video showing you how easy it is. I couldn't wait to test it out with my kids! They were not at all afraid to use it got the hang of it very quickly. You have to gently push on the pen and you can see a red light go on to show that it is working. My class could easily move the coins around to count them and select their answers. When I am done using it I can quickly unplug it and put it back in the box. The great thing about this is that I can use it on any whiteboard. If I were doing a presentation in the library or another classroom I could quickly set it up the same way. -It does need to be relatively close to your whiteboard, the farther out you have it the less accurate the calibration. -I found that I did have to recalibrate it once or twice when the wand didn't seem to be working accurately. Not sure why, but it only took me a minute to recalibrate. -I would suggest purchasing the wand extension. I found my kids had a hard time reaching up on some of the games or that they were blocking the sensor when they went up. Overall I think this is a great system for the price! You really can't beat it, especially if your school has limited funds. I plan to share it with my admin and staff. I am sure there will be a few more around my school very soon! For those of you who may find it still too steep a price, I would suggest writing a Donor's Choose grant. The price is right and I can see a project like this getting funded very quickly. I am so excited to be able to have this in my classroom. How do you use interactive systems in your classroom? I want to hear all of your fabulous ideas! I don't have an interactive whiteboard, so this looks amazing! It really is a great tool for the price! Another teacher without an interactive whiteboard! Thanks for sharing! Will be showing my admin with fingers crossed! Hoping you will get one Brandi! I am lucky enough to have a board in my room and can't imagine teaching without it! This sounds great though and I like that you can move around with it if you need to work in a room without an interactive whiteboard. Thanks for sharing! A few years back I got there document reader. The company was pretty new at the time and my Mac had trouble with it. They upgraded the software and worked with me to get it to work in the classroom. Great company, great prices, great ideas! I've sent your link and the product link to the teachers in our district. 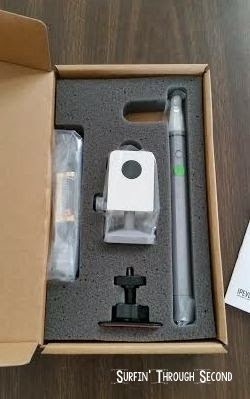 Corinna, will the iPevo work with Smart Notebook? I am not familiar with a Smart Notebook. I would contact the company and ask them.